On Friday, 26 October at 11.30am we offer you a public action training where you can take pictures and film. Afterwards, at 12.15pm, we invite you to an action briefing which is especially important for those journalists who accompany activists into the action. We will inform you about the exact places for those events on short notice. 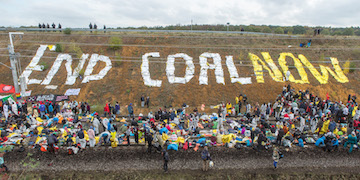 This year there will be a special Ende Gelände Train that leaves Prague in the afternoon of October 25 and will go via Dresden, Leipzig, Berlin, Hannover to Düren in the Rhineland coalfield. Media representatives are invited to travel on this train and speak to activists. If you are interested, we ask you to register early.